There’s no doubt that Picnics are fun. Add the word, “Vegan,” to the mix, and you got yourself a serious party. And, I’m not talking a party that’s just a few friends sitting on a lawn together. I’m talking a massive event where people from all walks of life congregate to get wasted and dance the night away. Yeah, that’s what Vegan Picnic is to me. It’s a party in my head! This place has almost everything a Vegan could want. From donuts, to fried chicken sandwiches, to cold pressed juices, to even doggy kibble (yes it’s Vegan too), it’s no wonder I feel at home upon stepping through the door. 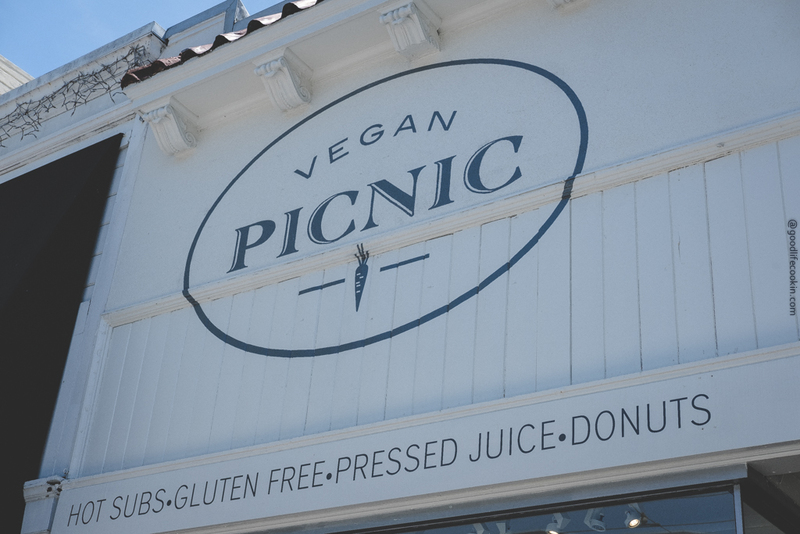 They have a sign that says, Donuts – 100% Vegan, right on the curb. If that’s not effective street signage, I’m not sure what is! Say no more! Right by the window seating, I noticed they had their donuts on display just as you enter the door. At this point, I’ve read their store front logo saying, “Donuts,” their signage in the front that says, “Donuts,” and now I see their donuts. What do you think I did next? Yup, you got it right. I bought their donuts and they were FIRE. It was the perfect prelude of what would become of this place. We cooled our pallet down with a watermelon rose juice from The Raw Juicery after absolutely destroying the donut. Then came the fried chicken sandwich. And while this place had other options like a salami sub and egg salad, their chicken sandwich was the most popular menu item, so we just had to try that. I do wish the chicken was a little crispier, but this sandwich definitely hit the spot. The bread was great, and I believe it was slathered in a Sriracha mayo that coated the chicken patty perfectly. It was such a simple sandwich and that’s what made it delicious. I’m going back to try their salami sub which I hear they get their cold cuts from the Butcher’s Son in Berkeley, CA. I’m so stoked that this place exists to share the Vegan love and build community in the Marina District. Do I sense that there are many more Vegan restaurants positioning themselves to pop up all over this city? I sure hope so!